Got it! Eureka! Also, World Cup beers! 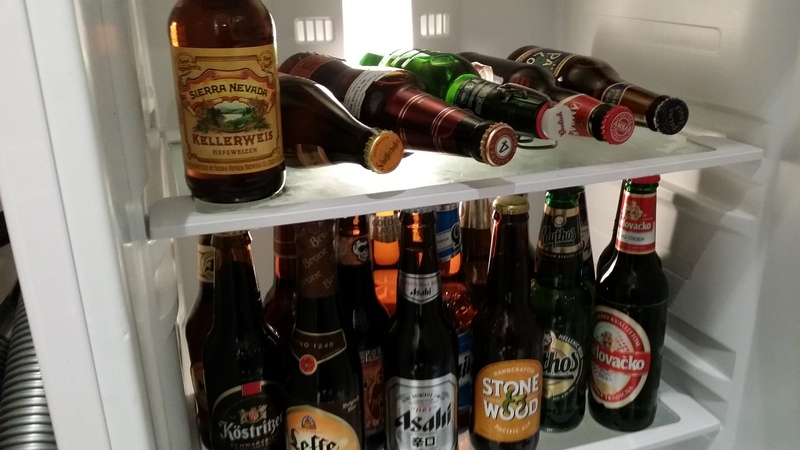 A very satisfactory day, ended with a fridge full of beers, each one from a nation represented in this year’s World Cup. This was the doing of a good friend: after we all chipped in, he bought all the beers by the case and mix-matched them. Glorious stuff. Don’t give up and let them out of something because you can’t figure out how to do it (yet). For example, if being taken downstairs means they will logically never be able to escape, don’t let them weasel out of that. Force them to figure out a way to do it before that time. Think back to things your characters have done before. If they are good at something, maybe knitting, can that help them here? Make each character play to their strengths. Can a problem be turned into an advantage? For example, an injury could help them to play dead more convincingly. What plot elements are floating around that could become opportunities? Is a mutual enemy nearby because of something else going on in the story? Does the social turmoil in the setting mean that a riot could be incited? Does anyone have a problem they could pass on to another? Don’t stop at the first idea you have, but don’t discard it either. Build up a bunch of ideas, and work them around each other. I used all these, weaving back and forth through the story to add sentences and paragraphs, sometimes tweaking what was there, sometimes setting up new triggers and elements. I think the result is an escape that should surprise and also feel real. This entry was posted in Writing and tagged beer, books, escape scene, fiction, world cup, Writing. Bookmark the permalink. 6 Responses to Got it! Eureka! Also, World Cup beers! Love these points–though I’m not sure how knitting could get a space pirate and his robotic parrot out of trouble 😉 I especially love the idea of building up several ideas around each other. It might seem impossible, but if you can get them to click, it will be ten times better than just one simple issue and solution. Hahaha a woolen lasso…now that’s pretty badass 😉 Yes! I love it. Thanks for sharing. I think people can’t board airplanes with knitting needles, can they? Also, love the beers! Enjoy them! Thanks, I’m into them now! I admit I haven’t had occasion to fly in a long time, so I don’t know what is shouted and what isn’t. Knowing the way I am, I would probably inadvertently bring my pocket knife on board, thus earning myself a place on the no fly list.